Pergolas make a fantastic spot for relaxing outside, having dinner in the sunny warmth, and enjoying your landscaping. If you are looking for a unique way to accent your landscaping and hardscaping, installing a pergola is a great option. What is a pergola? Pergolas are small outdoor rooms with rafters and no walls. They make a fantastic spot for relaxing outside, having dinner in the sunny warmth, and enjoying your landscaping. 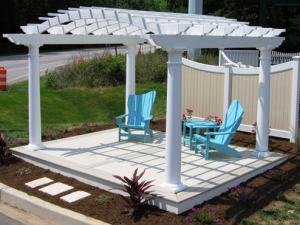 Here are some of the many different benefits of installing a pergola in your yard. If you love spending time outdoors or struggle to find a good entertaining spot in your yard, installing a pergola can create outdoor space where it wasn’t previously there. Depending on the roof that you choose for your pergola, it will offer some protection from the elements. You can leave outdoor furniture beneath your pergola for entertaining without worrying about it. Installing a pergola also gives you an area protected from rain in your yard if you have a lot of acreage on your property and can’t always dash back to the house mid-party. Most yard additions that you add to your home need to be, well, attached to your home. Decks and porches simply attach onto what is already there. Adding a freestanding design element to your home creates a different type of visual interest and can actually make your yard seem bigger than it is. If you want to get creative or romantic you can add flowing vines or even flowing fabric to the sides of your pergola as decoration. Unlike a normal patio or porch, installing a pergola allows you to choose exactly how much sun and shade you want to receive. Pay attention to how the sun hits that area of the yard during different seasons before jumping in and you’ll definitely be pleased with the end result.